Use water-based Schminke inks because they can be very dilute and mix beautifully on the paper. Do a painting on the plate using different thicknesses of pigment and leave to dry fully. Then selectively spray with water, and use gravity to move the pigment around, to produce the final painting. Hand print on damp paper. Many print variations can be made on the same inking plate through adding pigment and respraying. Helen Frankenthaler (1928-2011) was eminent among the second generation of postwar American abstract painters and is widely credited for playing a pivotal role in the transition from Abstract Expressionism to Color Field painting. Through her invention of the soak-stain technique, she expanded the possibilities of abstract painting, while at times referencing figuration and landscape in unique ways. Her 1952 Mountains and Sea, was a seminal, breakthrough painting of American abstraction. 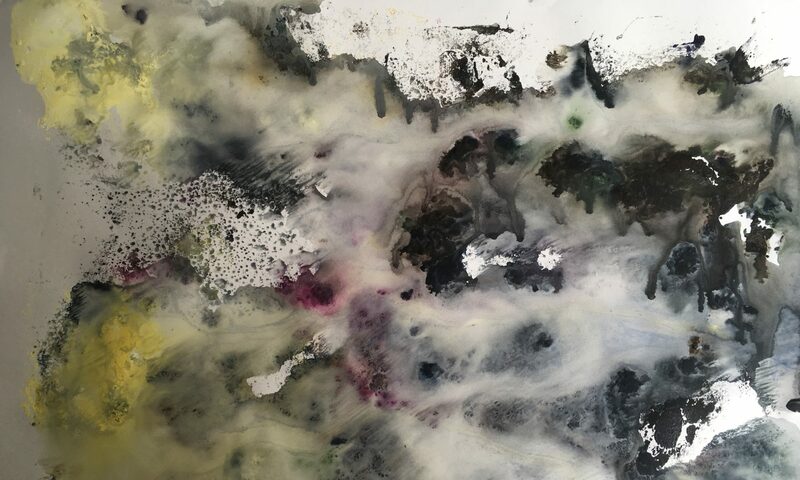 Pioneering the “stain” painting technique, she poured thinned paint directly onto raw, unprimed canvas laid on the studio floor, working from all sides to create floating fields of translucent color. Mountains and Sea was immediately influential for the artists who formed the Color Field school of painting, notable among them Morris Louis and Kenneth Noland. Some of the most impactful for the mixing of pigments on the surface are her watercolours. In addition to unique paintings on canvas and paper, she worked in a wide range of media, including ceramics, sculpture, tapestry, and especially printmaking. As a significant voice in the mid-century “print renaissance” among American abstract painters, she is particularly renowned for her woodcuts.